In surveys, most people answer most questions. That is true regardless of whether or not questions are coherently constructed and reasonably articulated. That means that absurd questions still receive answers, and in part because humans are similar to one another, those answers can even look peculiarly consistent. I asked an absurd question and was rewarded with an entertaining answer. Some years ago, with Tom Meyvis, I tried to develop a manipulation to create an association between speed and virtue. Our spartan publication history on the topic testifies to our (lack of) success. That doesn’t mean that the pilot data weren’t interesting for a different reason. Participants saw a sequence of 20 animal photographs and rated each on one of two bipolar dimensions: speed or goodness. The former is straightforward. The latter could be best construed as an evaluation of moral worth. That is an absurd question. What sorts of answers did we receive? 2. Aquatic race featuring: Jellyfish vs. Starfish vs. Walrus. Who wins? People give the jellyfish the edge. The starfish has no chance. 3. Nature documentaries frequently bandy about facts like, “hippopotami kill more people every year than heart disease.” My respondents overlooked that; Hippos are more moral than sloths (which nature documentaries never mention for their killing ability). 4. The orangutan is not just a mammal or just a primate, it is a great ape. Huge opportunity for some ingroup favoritism. Instead people favor the cheetah, walrus, and hippo (amongst others). Explain that. Perhaps some absurd questions have correct answers? I asked a pair of experts. Pieter Thomas Jefferson Johnson is an ecologist possibly best known for solving a major scientific problem before he was old enough to drink. Michael Jennions is a world renowned evolutionary biologist, known for many things, including this video (the link alone makes this post worthwhile). I asked them to rank the 20 animals for speed and morality. 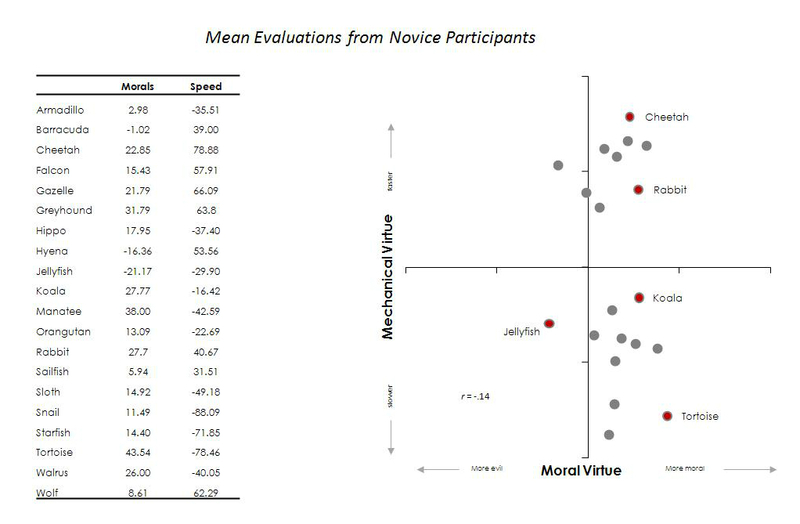 Their speed ratings are similar to each other (r = .91) and the novices (r = .87). Morality was trickier. Both said that any response would be random, or as Piet said, “I would probably tie them all in ranking”. But responses aren’t quite random. 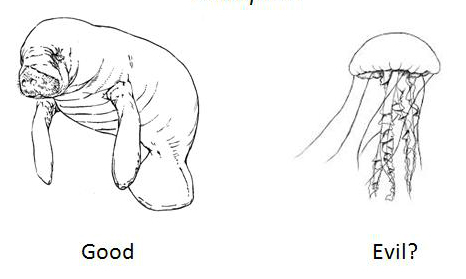 Michael rated based on the complexity of the central nervous system (complex = evil), whereas Pieter used “trophic level, followed by an inverse body mass index”. Despite very different approaches, they are mildly correlated with each other (r = .29). Experts and novices all agree on the virtue of the Tortoise, but Michael and Piet are just as fond of the lowly snail. **Don’t run that study. I mean it.